Back in the 1800’s builders could buy lumber in widths up to 24 inches wide, old growth trees provided that wood and they are long gone. Today if you need a wide piece for a project such as a table or wall cabinet you have to join two or more pieces together. Over the years there have been many ways to join wood together, glue, wood dowels, metal cleats, even mortise and tenon joints. But the one single problem with all of these methods is getting the wood properly aligned so the joint would be even and true. Dowel jigs helped but they are not completely fool proof and careful placement of the jig is necessary to assure an accurate joint. Mortise and tenon joints are strong but much time and efforts goes into creating them. Enter the Biscuit Joiner, this revolutionary tool makes joining two pieces of wood very easy and simple. Hermann Steiner invented the Biscuit Joiner in the late 1950’s in his Switzerland carpenters’ shop. He called it the Lamello Joining system. Lamello Biscuit Joiners are still sold today. To use the joiner, simply align the two pieces, draw a reference mark across both pieces, separate them. Align the joiner fence with the reference marks and cut the slots on each piece, then glue is applied and a biscuit is placed in each slot to align the wood perfectly as the glue dries. This makes a joint that is actually stronger than the surrounding wood, and it is perfectly aligned. The wood pieces that are used in the slots are called biscuits as they are oval shaped and made from compressed wood which swells (or rise like a biscuit) when they are exposed to the moisture in the glue. The advantage is the speed and accuracy of the process, just a few minutes to make an incredibly strong and clean joint, instead of hours cutting mortise and tenon joints or trying to get a dowel jig aligned properly. 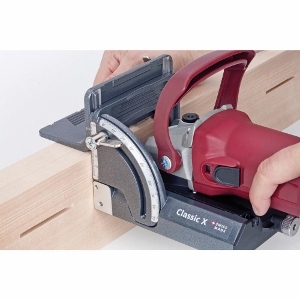 The next time you are working on a woodworking project and need two pieces of wood joined, get a biscuit joiner, you won’t believe how easy it is to use. As a long time woodworker I would have to say that my Dewalt biscuit joiner is one of my all time favorite Christmas gifts. I used to use dowels for keeping my pieces aligned while i was gluing them up but than I read an article about a biscuit joiner and that's all it took. I had to have one. So that was my must have on my Christmas list. I use it on just about every project that I joint two pieces of wood together. Since there are different size biscuits the possibilities are endless. I feel that using biscuits speed up the building process also. You don't have to worry about the boards slipping which causes more time after the fact. It take very little sanding or one pass through the joiner and your all set to move on to the next step. If you do woodworking and do not have a biscuit joiner you need to get one it will change your life. While I haven't actively been working with wood in many years, I too had a DeWalt biscuit jointer when I first started out. I think watching Norm Abrams of The New Yankee Workshop had something to do with that. What I found was the DeWalt just wasn't accurate enough for long grain joints (like a table top) and actually contributed to boards not being even, rather than helping them to align. Flat boards, square edges, and Bessey K-body clamps worked a lot better for me. I did use it frequently as a way to make loose tenons, that it worked quite well for.